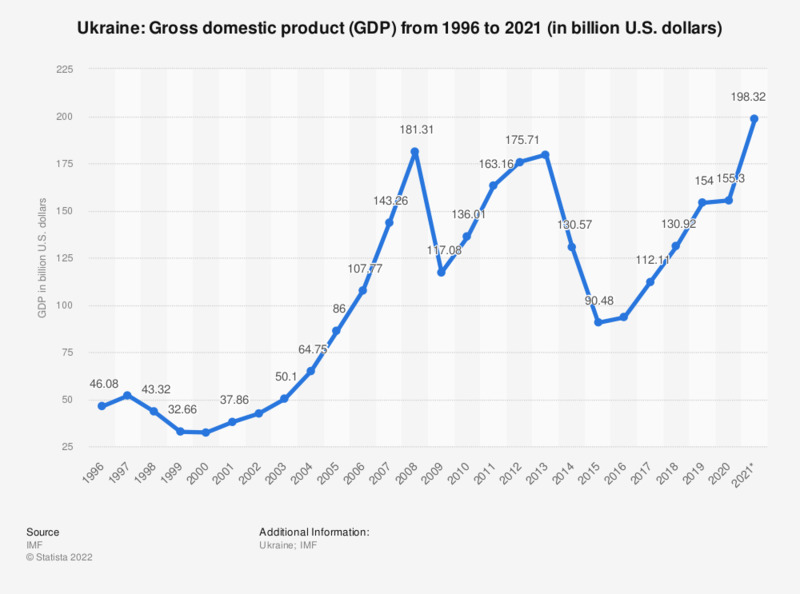 This statistic shows the Ukrainian gross domestic product (GDP) from 2012 to 2017 in billion U.S. dollars, with projections up until 2022. In 2017, Ukraine's GDP amounted to approximately 112.13 billion U.S. dollars. See the Russian GDP for comparison. In just two years, between 2013 and 2015, GDP in Ukraine has been dramatically reduced to half its amount. This very severe decrease is mainly due to the civil war in the eastern part of the country, which is causing many of its inhabitants to be internally displaced, and life in general to become increasingly difficult for Ukrainians - not just because of the war, but because the country’s economy is in desperate trouble: The inflation rate has risen to almost 50 percent, the second highest rate around the world behind Venezuela, and unemployment is now at over 11 percent. The industrial Donbass region located to the east of the country has also been devastated. Russia, Ukraine’s most important import and export partner until recently, most likely no longer plays this role, having caused a great shift in the country’s base economy. Ukraine’s national debt in relation to GDP is also unsustainable, having increased by over 50 percent in the last two years. Default or restructuring of its debt was inevitable, and eventually restructuring took place in August 2015. While the economy is expected to recover somewhat in 2016, its stability will depend on improving the stability of the country in order to create an environment in which the economy can operate and recover. In your opinion, do you think the EU is being too tough, not tough enough, or about right in dealing with Russia on the issue of Ukraine? Ukraine: In your opinion, what should the future political status of Crimea be? As you may know Britain and other Western countries have imposed economic sanctions on Russia over the conflict in Ukraine. Do you support or oppose these sanctions? Do you consider Ukraine an ally or an enemy of the United States? In your opinion, who is most to blame for the violence in eastern Ukraine? Who has benefited from democratic changes in Lithuania, Russia and the Ukraine since 1991? How likely do you think it is that war will break out between NATO and Russia in the next five years? Recently the conflict between the Ukrainian government and pro-Russian separatists has intensified. How closely are you following this story? Ukraine: Do you support the decision of the Russian Federation to send its army to protect Russian-speaking citizens of Ukraine? In your opinion, should we rely on a democratic form of government to solve our country's problems? Would you support or oppose Britain and its NATO allies providing large-scale military equipment to the government of Ukraine to aid in its fight with pro-Russia separatists? Ukraine: If a referendum were held today on Ukraine joining the European Union, how would you vote?